Request valuation of "LEGO Bike"
When i was younger i was given a LEGO bike. My mother won it at LEGO (she worked there). Only 7 were ever made. It's made by the BMX company GT. Now i've gotten older. I need to sell this thing. How much would you guys think i could get for it? It has been used, but does not have many scratches, etc. I am by no means an expert on this, but that looks like any random bike with a LEGO decal put onto it. It is hard to tell from the picture but is there anything else on there that makes it a "Lego Bike"? Just wondering because that totally sounds like something my parents would have done (and did do once) put a brand name sticker on a no name brand and gave it to me telling me it was the brand name. I think your biggest problem is going to be documentation. 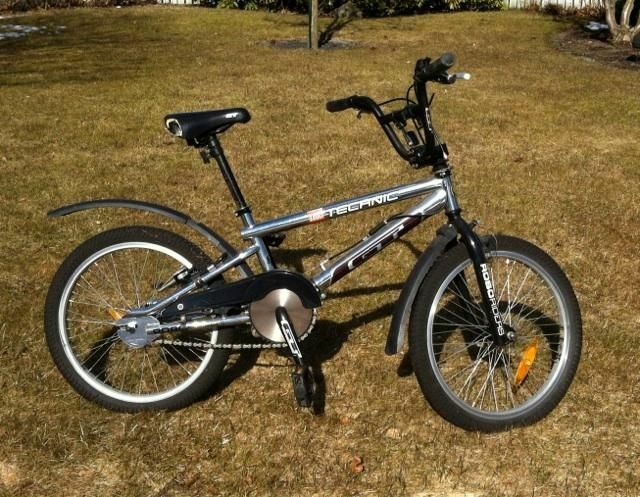 You might want to find a BMX bike collectors forum. I'm sure there is one out there somewhere. I was expecting a bike made out of Lego. Epic fail! I was expecting a Lego bicycle in a rare color. ^ Same here. I have a collection of these and thought there might be a new color. I was at least expecting something small and...you know....plastic! I have a one-of-a-kind Lego washing machine. Made by Sears Kenmore but proudly displaying a Lego Octan label just below the cycle dial, it may not work but is definitely a collectors' item! Hey, at least it's chrome. It could have been just a plain old Han Solo bike. @mixtheman I think the answer is: not a lot. Kids bike collectors don't collect Lego. There may be one or two people out there obsessed with both, but I think it's a long shot personally. So do we think more or less than http://www.bricklink.com/catalogItem.asp?P=4719c01 in either bright light blue or medium blue? Sorry to continue the thread hijack, but mudguards and a chainguard on a BMX? Isn't that why Mums wash with Persil? Good luck to you though, finding collectors of both bicycles and Lego might be a challenge, but I bet they are out there somewhere. It's not actually that uncommon for large brands to have half a dozen bikes made by a recognised manufacturer for a promo of some sort. I remember my mate as a kid having a JCB labelled bike. I'm fairly certain it was made by Raleigh but there was no mistaking it was a JCB. Take all of the licensed LEGO tat thats available right now. There's no reason for me to think this bike wasn't given away to a member staff by LEGO. Having said that, proving might be a little harder. I'd put a call into GT if I were wanting to trace its origin. @mixtheman - Ah, that explains it, lucky you! Dont they ride bikes and such around the factory as well? I was going to say it looks authentic because it's more than just a "Lego decal slapped on a bike". You can clearly see the word "Roboriders" on it, too, signifying a tie-in to that short-lived precursor to BIONICLE, the Roboriders from 2000. Connected with the Technic logo and the overall color scheme of the bike, and it definitely looks like something Lego would commission in those days of imminent collapse (1999-2000). How common are the yellow ones? I have have a yellow mail carriers bike Im selling. I dont really do city now and I want to invest in other lego. In the meantime, if your dad works at Lego - can you ask him when the Fire Brigade and Death Star sets will retire? I'm only half-joking, of course. The yellow one is uncommon. Only came in that mail carrier set. Goes for about US$8.50 (used) on Bricklink. You can't even talk about those 2 sets at Lego. A memo was sent to all employees. They would save themselves a lot of trouble if they would just publish the retirement dates for those two sets and be done with it. I was was only kidding buddy. It is just taboo to talk about those 2 sets. So do not run into the LEGO offices and say 'Fire Brigade'? Has anyone got a guess on value? If I saw this in a garage sale, and I could take it home then, I would pay $20. If I saw problems other than the pictured seat issue and basic maintenance items, $0. No one else has an idea? More importantly, that bike hasn't been assembled correctly. The headset stem is the wrong way round, which makes it a bit dangerous! As I mentioned earlier, I really don't see this being appealing the the 'collector' market, therefore you are looking at the price of what every other bike of its condition would sell for, give or take a few $'s depending on whether the kid likes Lego. I agree, I really don't think you'll get much for it unfortunately. Yeah, most LEGO collectors are in it for LEGO building elements and a smattering of related things like instructions, boxes, and catalogs. Other promotional items are.... tricky. There are a few people that collect odds and ends like this, but not many. Some people might want it for their kids to ride, but they probably won't pay much more for it than a regular bike-- their kids won't know what Roboriders are, so it'll look a little odd. Collectors MIGHT want it, but it's a difficult item to display (because it's so large), it's not well known (so most people wouldn't even associate it with LEGO), and falls outside of the realm of what most collectors would consider to be a "necessary" part of their collections. In short, it's an interesting novelty, and it's cool that we (as a community) now have a bit more information about it. But it's probably not worth very much. Maybe some place like the Plastic Brick Museum would be interested, but outside of that unless you find someone who loved that theme, I don't see it being in much demand.